Editor's Note: This feature originally appeared in the May issue of MReport, out now. The digital mortgage revolution enthralled the mortgage industry, creating a massive secular shift from pen and paper to a digital experience. Enterprise-level websites defined the first wave of this shift, which provided a platform for lenders to align with consumer trends and attract borrowers online. Now, lenders need to convert their website visitors into borrowers. That’s why digital point-of-sale (POS) applications will drive the next leg of the digital mortgage revolution. We’ve witnessed a lot of discussion surrounding the technological aspects of digital POS applications. Digital POSs don’t replace loan officers; they maximize their capabilities. Loan officers (LOs) face a lot of pressure. They have to generate leads and find potential borrowers. Then there are the deadlines from real estate agents and brokers. Some corporate LOs receive strict sales targets from management. Mortgages link to macroeconomic activity, falling prone to big swings in the greater economic picture of interest rates, consumer spending, and wage growth. So when business is slow, it’s slow. When business is booming, it’s booming. And when it’s booming, LOs need to capitalize and close as many loans as they can. Now, this doesn’t mean that LOs should sacrifice loan quality, compliance standards, or customer relations in place of closing a loan faster. Instead, LOs must embrace loan quality, compliance standards, and customer relations while closing loans efficiently. That’s where a digital POS factors in, affording LOs the ability to close more loans faster while ensuring quality and compliance. Digital POS’s boost LO capabilities in four key ways: Simplifying workflow, boosting productivity, increasing loan closures, and making borrowers happier. Digital POSs simplify and streamline workflows. According to the Mortgage Bankers Association, between 2010 and 2017 mortgages took 70 percent longer to close—with the national average at 51 days. Mortgage origination always stood as a long, drawn-out, paper-intensive process. First, LOs have to validate information through third-parties like credit verifiers and banks, plus request information from those third parties, such as bank statements. Then, LOs wait for the documents to be snail mailed and send documents back and forth, not to mention spend hours scanning through the documents and drawing red flags like income discrepancies. Once a discrepancy was found, alerting the borrower of those discrepancies and waiting for a valid explanation was the next step. I remember when I used to meet people at their kitchen tables and fill out forms, making sure every line of information was correct. I’d spend 90 minutes meeting with them, and always left with a stack of papers. Then came 2008. The housing crisis dropped a bomb packed with regulations and compliance standards, and continue to impose new laws. In effect, timelines got extended as loans had to maneuver through an approval procedure inundated with checkpoints. All that said, loan officers need to save any time they can during the loan origination process. That’s where a digital POS factors in. First and foremost, compliance standards are engineered into digital POSs. They ensure that borrowers input appropriate information and that the LOs have a proper base to work with. For instance, mortgage applications require borrowers to provide at least their past two years of residency. If a borrower inputs that they’ve only lived at his/her current residence for nine months, the POS is engineered to ask for further information, so it can fill in the other 15 months of required residence history. Integrations with credit verifiers, asset information, employment history, and more produce pre-validated information for the loan officer. Now, the borrower isn’t telling you their credit score—the credit verifier is. By spending less time verifying information, LOs can begin other origination procedures faster and spend more time engaging the borrower. Moreover, these integrations—the sheer power of accessing information at a faster rate—shaves time off of the loan origination process. Integrations and automation afford LOs to receive borrower information including his/her bank account, for example, in minutes, rather than having to wait days. LOs can see almost instantaneously how much money a borrower has—information that can impact underwriting factors like down payment, total loan amount, and interest rate. The best digital POSs don’t only pull asset information providers, they pull documents along with it. Rather than make a request and wait for bank statements, for example, the digital POS and its integrations automatically pull those statements and prepare them for the LO. Just like borrowers enter information through a POS portal, LOs have a back-end portal to originate loans and communicate with the borrower. Building on the bank statement example, LOs have that information pulled for them. When they sift through the documents, which technology can help with too, and identify red flags, they can alert the borrower of those red flags within the POS application. Now, all of the loan information and origination exists in one central location. Communication is streamlined, and the information is organized. LOs aren’t going to their email or phone to talk to borrowers, explain the discrepancies, and send over documents; they’re sending a brief message in a connected portal and directing borrowers to the exact information they need to address. This streamlines the origination process while smoothing borrower relations. The two-way portal also makes borrowing easier. LOs can enter a specific loan application and guide a borrower while he/she fills it out. Rather than sending a borrower to an FAQ page or having them call a 1-800 number, an LO jumps inside the application, theoretically sits next to the borrower, and answers any question they might have. In essence, the two-way portal brings high-touch to high-tech. The digital POS—equipped with all of its benefits—drives increased productivity, affording LOs to close more loans faster. Closing more loans faster—while not compromising compliance, quality, or borrower satisfaction— defines a productive, successful loan officer. Beyond originating loans faster, digital POSs allow for LOs to spend more time on lead generation and business development. Now, LOs can increase their amount of prospects and turn more of them into borrowers with the user-friendly POS application. Most importantly, even with increased opportunities and volume, LOs still have more time to nurture borrower relationships. Having more time to nurture borrower relationships results in happier borrowers. Happier borrowers mean increased business, whether it’s through generating repeat customers for refinancing and buying second homes or generating positive buzz through word-of-mouth. Some people think that with technology, comes de-personalization. That’s not the case: technology affords LOs more time for personalization and to give each borrower proper attention. Equipped with a two-way portal POS, they can guide borrowers through each step of the application process and solve discrepancies more efficiently than before. Borrower-LO communication is streamlined and simplified, preventing confusion and frustration. With increased efficiency, LOs spend less time talking about bank statements and more time about the borrower’s home buying goals. Digital POSs in and of themselves satisfy borrowers by making home buying easier. The application process, long and information intensive, has confused the most financial-savvy consumers and overwhelmed them with requirements. 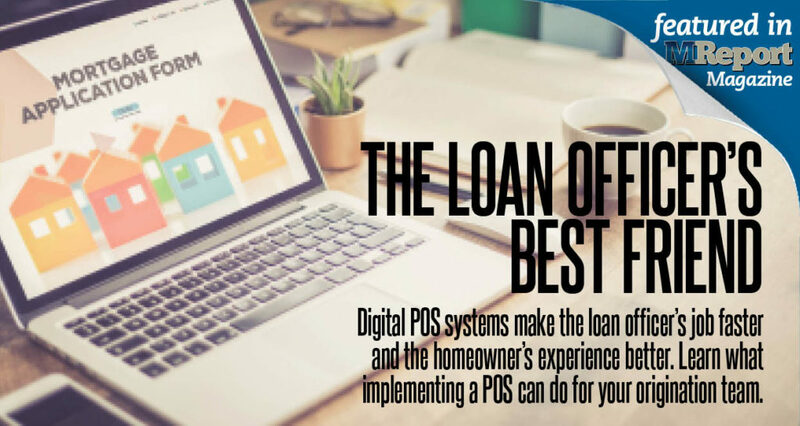 Digital POSs simplify the application process and guide users through each step to make mortgages easier. The power of digital POSs is apparent even in the most basic form of mortgages: Pre-qualification applications. These short, yet helpful applications can pre-approve borrowers in minutes. Rather than find a home first, borrowers can get pre-qualified. Pre-qualification affords borrowers to search smart and find homes within their budget. With this guidance, home buyers make better decisions that expedite the entire home buying process and lead to more seamless mortgage underwriting. Evidently, digital POSs impact the home buying lifecycle, from the first open house to the closing date. Going deeper into the borrower side of the application process, digital POSs employ AI and smart algorithms to intuitively react to each borrower. For instance, if a borrower indicates at the beginning of the application that he/she does not have a co-borrower, POSs can intuitively know not to open any data-entry fields for co-borrower information. This results in less confusion and faster completion times. With auto-fill fields and integrations, borrowers need not enter line after line of data, shifting back and forth between tabs and forms and documents to find each piece of information. Borrowers simply enter their social security number to run credit and their bank account number to run assets and income. Borrowers don’t scan through their tax returns; POS connect to the IRS and retrieves all the data it needs. All of these factors lead to a seamless application process that results in happier borrowers. Increased loan officer productivity leads to more time for lead generation, business development, and nurturing borrower relationships. Digital POSs transition website visitors into borrowers. Combined, these factors boost top-line results. While those factors inherently impact the bottom line as well, digital POSs benefit profits further by increasing margins. For one example, overhead costs get reduced as LOs no longer send and receive hundreds of pieces of paper. In effect, as digital POSs boost loan officers’ productivity, their productivity simultaneously benefits top and bottom line results. Copyright © 2014 theMReport.com. All rights reserved.